Cargo Velocity provides civil design support by producing detailed conceptual plans for marine container (conventional and automated), intermodal rail, and truck gate facilities. Cargo Velocity's designs create form around customer vision. 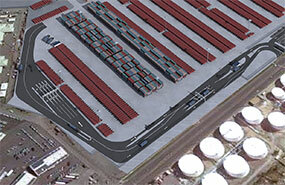 Our engineers are experienced in seaport, intermodal facility, and airport civil design. Services include off-site access and traffic concepts, conceptual grading studies, cross section plans for channels and berths, conceptual construction cost estimates for pavement, power, and fresh water needs, preliminary civil design for gates, yard layout, and striping plans, and site security fence plans. Cargo Velocity provided terminal and gate planning and analysis. 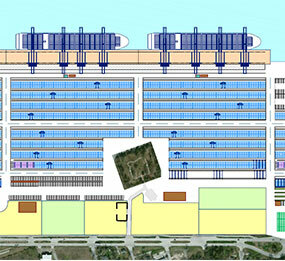 We developed detailed conceptual plans for an 80-acre, two-berth, brownfield container terminal. Services included detailed gate planning for access roads, truck gate, building and parking areas; also master-planning and construction phasing. Developed conceptual drawings to a 10% design level that addressed traffic circulation, gate layout, maintenance/repair, access roads, and yard striping. Role: Planning sub to Dannenbaum and Cardno TEC, Inc. Developed automated and conventional operating mode alternatives including RTG, and other operating layouts. Developed yard layouts and cross sections for the proposed operating modes. Refined plans, capital cost expenditures (CAPEX), and operating expenditure analysis (OPEX) for preferred options.